A tour of the most popular hill station from Pune, Mahabaleshwar and Panchgani is known for their scenic beauty and one of the very few evergreen forest area in the country. Visit the famous places in Panchgani and Mahabaleshwar. Take a tour of places like Mahabaleshwar Temple, Elphinstone Point, Arthur Seat Point and many more during your two-day tour. 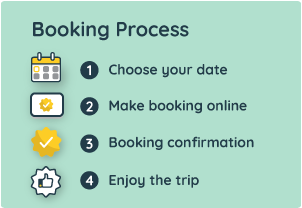 You can specify your preferred time for starting the journey while booking. You will be travelling approximately a distance of 120 km and it would take you about 3.5 to 4 hours to reach Mahabaleshwar. On the second day, your tour will again begin with a pick up from your hotel in Mahabaleshwar/Panchgani. It takes up to 4-hours for the return journey, so you may want to plan your day accordingly. Charges for the private air-conditioned cab for the limit of 500 km. There is a time limit of 2-days and 550 km on this tour, so please plan your stops accordingly.